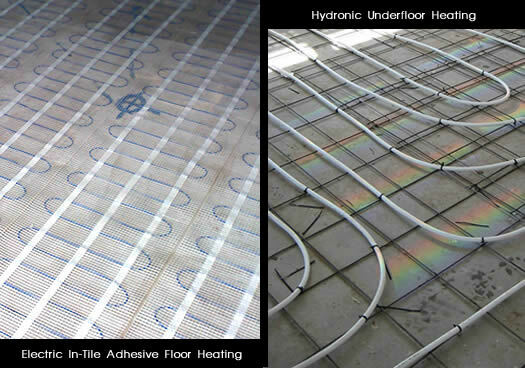 ELECTRIC UNDERFLOOR HEATING vs HYDRONIC UNDERFLOOR HEATING? Both electric and hydronic underfloor heating systems offer a superior comfort experience with traditional heating systems. Heat is gently distributed evenly over the entire rooms floor area providing warmth to suit the feet, body and head. So why would you choose electric over hydronic underfloor heating? There are several reasons including type of building work, floor build up restrictions, efficiency, control and capital cost. Renovations and New Buildings: Electric underfloor heating is best suited for single room renovations or additions. An electric system offers a low build up height of about 2mm. The under tile system is installed on the existing floor surface (concrete or existing tiled floors) and simply embedded in-tile adhesive. Also for new buildings, particularly where only select rooms such as bathroom or bedrooms are heated through underfloor heating, an electric system is affordable to install an easily incorporated beneath most floor finishes, directly under tile or carpet, with or without a screed topping. South Africa a Heat-on-Demand country: South Africa is a country where heating can be turned on when required. Compared to European climates where the winters are long and where ice and snow are imminent and it is more practical to install Hydronic Heating, as this has to remain on for the duration of the winter. Hydronic heating systems take long to heat up an entire space and therefore must remain on to enjoy comfort. An electrical system can be electronically controlled to switch on hour before you arrive home from work so that you experience the same comfort as if it was on all day long. With good floor insulation an electric system can heat up in 15 minutes. 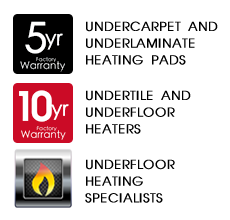 A heat-pump Hydronic System has a compressor which must be directly placed to absorb outside air temperatures. These work wonderfully when the outside temperature is bearable but take huge strain when sub-zero temperatures are experienced and struggle to meet their purpose. These also are also maintenance dependant and do not have near the lasting capacity of the electric system. Electrical Systems have been found to last as long as your next floor renovation. Some homes have electrical system still functioning after 40 years without 1 cent been spent on maintenance. comfort of your home or office.